This day is such an important day to our family. Today is my Dad's Birthday and my Brother-in-law got married this morning at 6:30 am IST. Just to celebrate this occasion, I made "Eggless Chocolate cake". I got this recipe from here. I followed their procedure except that I used lemon juice instead of white vinegar. Also, I added just 1/2 tsp of baking powder which was not actually in the procedure and little less quantity of cocoa. This is for you Appa...Hope you like it! These pieces are for you guys...Happy Wedded Life...Enjoy my cake! Wish your father many more happy returns of the day and Congats!!! to your BIL. Bday wishes to your dad & wishes for your bil for his newly married life...chocolate cake looks yummy,perfectly done and soft.. Delicious cake!! happy b'day to ur dad & congrats to ur BIL!! Looks Very Delicious. We also join in wishing your B-I-L & his wife & birthday wishes to dad. Wishing ur dad many happy returns of the day and Wishing ur BIL happy wedded life... The cake is awesome and wonderful for the occasion..its looking soooooo moist.. 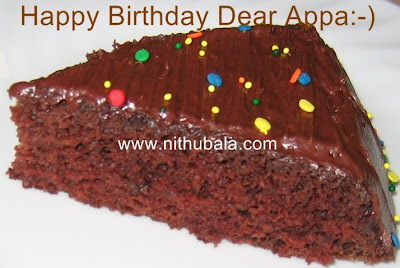 Convey my B'day wishes to your loving Dad Nithu. சூப்பரான அழகான கேக் பார்த்ததும் சாப்பிடனும் போல் இருக்கு. Nice Cake Nithu, hearty congrats ur Appa and ur BIL. Our Hearty wishes to yoiur Dad and BIL NIthu..Cake looks scrumptious..
Nice and moist cake.Hearty wishes to your father and BIL. Yummy moist and decadent chocolate cake. Birthday wishes to your dad and wishing a happy wedded life to your BIL. My hearty birthday wishes to u dad and a beautiful married life to ur BIL...fantastic chocolate cake Nithu.. Send my wishes to your dad & BIL..wonderful cake very tempting..
Best wishes to ur Dad and BIL. Cake looks yumm.. Happy birthday to your appa and wishing your brother in law happy married life. our best wishes to your Dad & BIL & the new bride.. Nice way to celebrate with a simple choc cake..
Cake looks super delicious....Bday wishes to ur dad and best wishes for the newly wedded couple. 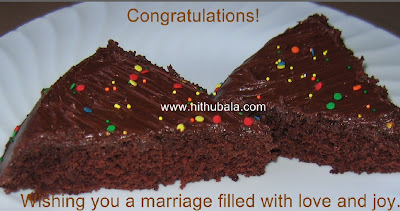 Thats such a moist and tempting cake, Nithu..Our best wishes to your Dad and BIL.. I've been seeing a lot of eggless cake in blogs now-a-days. I think it' s time to try one. yours looks so moist and spongy. lookss soo perfect. lovely cake and many happy returns to ur father. Best wishes from my family..:-)) cake looks yummy !! A very Happy Birthday to your Father! Best Wishes to your BIL! beautiful choco cake.. and eggless.. great! Warmest wishes to ur daddy and to ur bil. Nothing to beat a cake filled with lots and losts of love and affection. First of all Happy B'day to your Father and best wishes for the newly wedded couple. Cake looks very moist and tempting. Cake looks super moist! Best wishes to your dad and lots of happiness and love to the couple! yummy recipes n great work !!! keep it up !